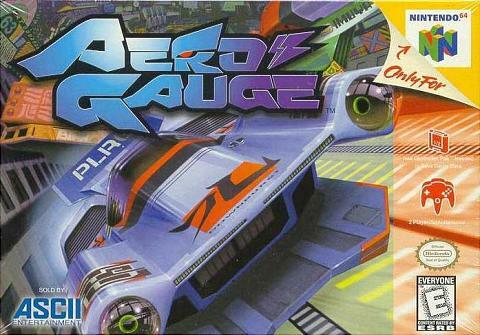 Aero Gauge for Nintendo 64 is racing in a futuristic setting. Choose from up to 10 aero-machines to pilot through six different courses. In Grand Prix mode, you'll have to qualify and race through four courses against computer-controlled vehicles. The Single Match mode lets you race one track against the computer, while the Versus mode matches you head-to-head against a friend. In Time Attack mode, it's just you against the clock, racing for the best time. You'll have to be alert though, because you'll be twisting, flying and avoiding obstacles and other racers at speeds of up to 1,000 miles per hour.